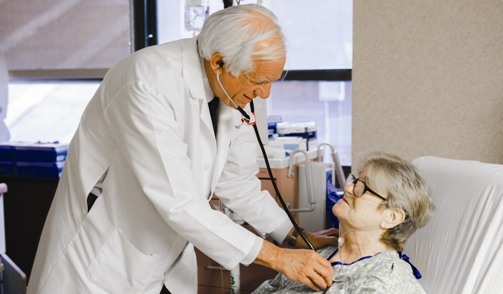 patients who are dealing with health issues directly related to aging. Physicians and other health professionals affiliated with the Institute are available to speak to community groups on a variety of topics related to healthy aging and geriatric medicine. Other community outreach activities include the distribution of informational materials, support groups for patients and caregivers, a monthly lecture series aimed at adults over the age of 60 and ongoing relationships with senior centers, home care services and nursing homes throughout Brooklyn. To request educational speakers or other community participation from NYPBMH relating to the Institute for Advanced and Minimally Invasive Surgery, or for more information, please visit the relevant Community Education and Programs pages and contact the Department of Public Affairs with your request or inquiry. More than 10 percent of American adults over the age of 65 display signs of memory loss or dementia. NYPBMH's Diabetes Education and Resource Center provides comprehensive diabetes self-management education. Osteoporosis affects some 20 million people—both men and women—each year. Many older people live with joints that have been damaged by arthritis and other diseases or injuries. NYP Brooklyn Methodist operates an inpatient hospice unit in partnership with the Visiting Nurse Service of New York Hospice. If you have chest pain or think you are having a stroke emergency, call 911. The Fall Prevention Program seeks to provide older adults with the confidence and tools to help them age safely. To find a physician affiliated with the Institute for Healthy Aging, click here or call 844-780-9355.